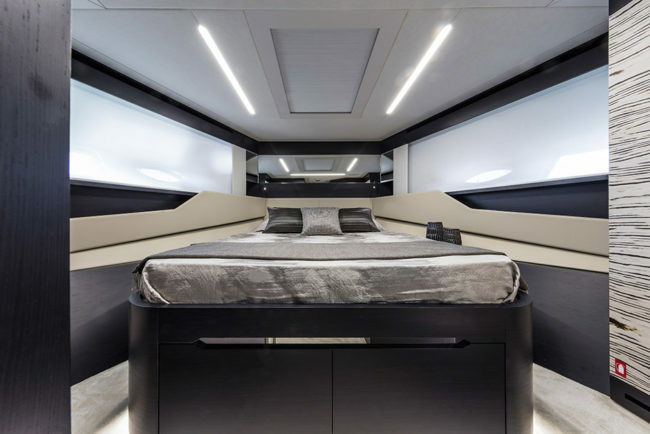 She made her debut at Boot Düsselorf, in the footsteps of the larger 9X: Pershing 8X uses carbon fiber to lighten the structure and increase the space on board. 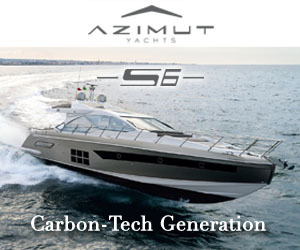 With over 5200 hp she reaches 48 knots, and cruises at 41. 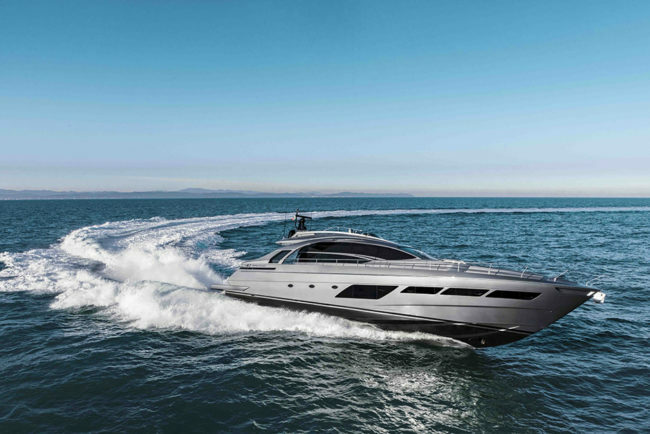 Pershing confirm their vocation for technical and performance excellence with the new Pershing 8X, a 25-meter sports yacht built with an extensive use of carbon fiber and the best available technologies. 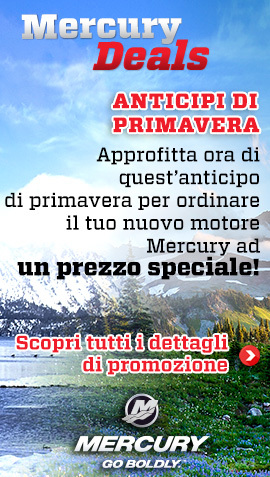 Or, when they are not available, introducing new ones, as we will explain in a while. 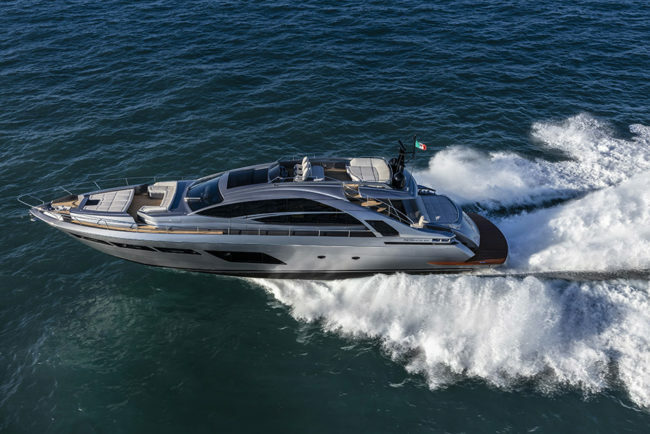 As usual Pershing 8X is designed by Fulvio De Simoni together with Ferretti Group. 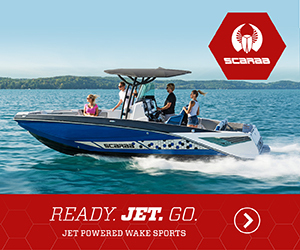 The look is sporty thanks to the side wings, which have recently become a distinctive stylistic element of the brand, and to the virtually invisible upper deck, which offers the comfort of a large additional space without compromising the sleek and aggressive lines. 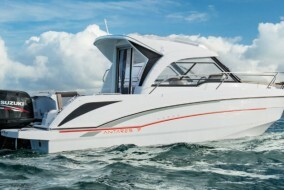 To aft, the garage can house a tender up to three and a half meters, typically a Williams Sportjet 345, and a jet-ski. 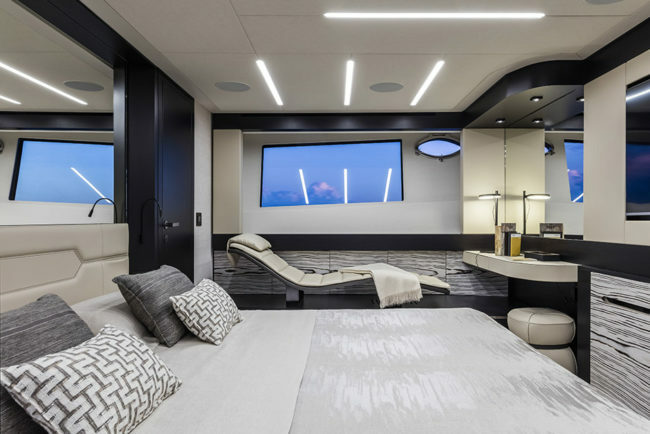 The cockpit houses a sun pad and the outside dinette with a sofa and a small table which, upon request, is electrically lowered and can become a second relaxation area. 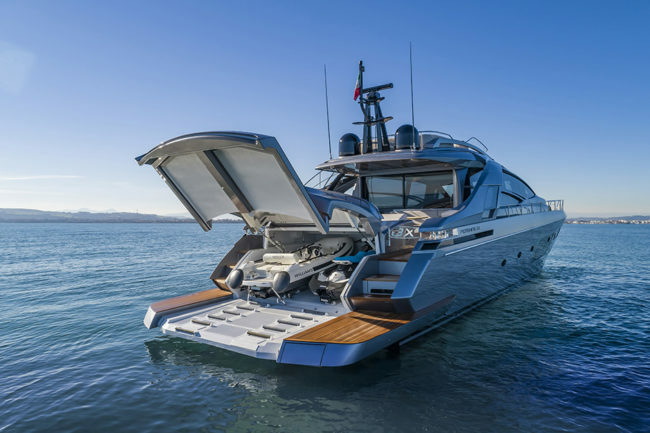 To starboard the kitchenette features a grill and a sink, but to port is the first innovation of this new Pershing 8X: the sundeck access ladder is integrated into the typical side wing, which thus becomes a functional as well as an aesthetic element. Composed of black-painted steel steps covered in teak, framed by a carbon fiber stand and two handrails, this solution allows a good stylistic cleanliness but above all more space in the cockpit and on the sun deck. 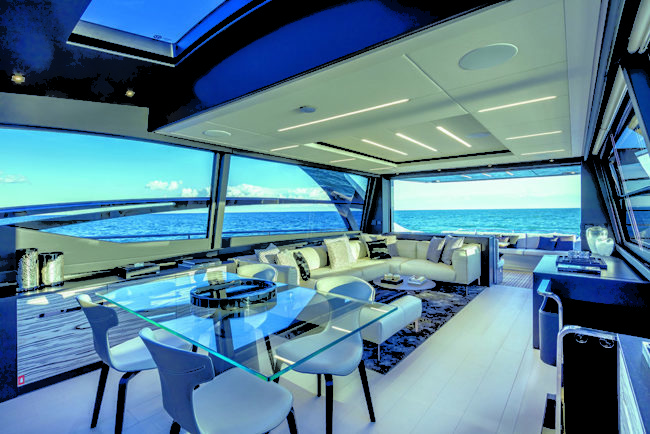 To bow the area consists of a sofa and a separate sundeck. Optionally, the terminal part of the sundeck turns into an opposed sofa, creating a concealed dinette. 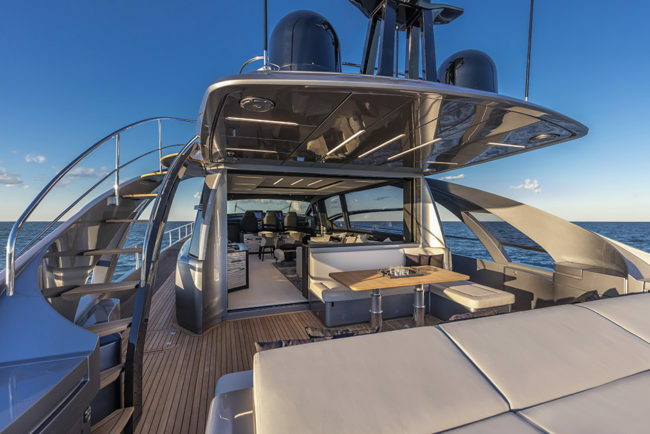 Stepping up the aforementioned staircase, you reach the wide space of the upper deck: a large 5 sqm sun bed faces a sofa, while the helm station has a very low profile thanks to the tilting screens. 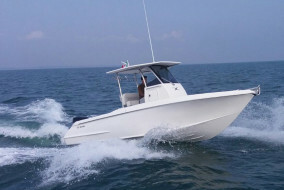 All outdoor areas can be protected by bimini and awnings. 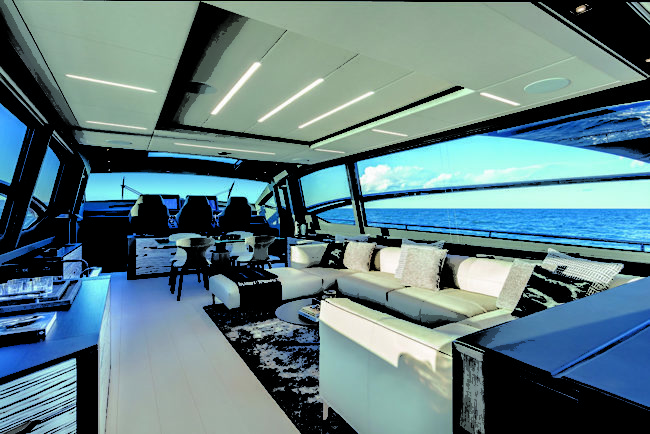 Once opened, the cockpit glass door turns the entire main deck into a large open space, about 50 sqm. Still, the area is organized into three separate parts: living room, dining area and helm station. 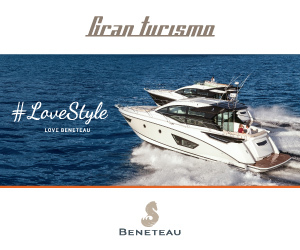 The double side access, with two doors by the wheelhouse, increases the practicality and allows passengers and crew to move independently. 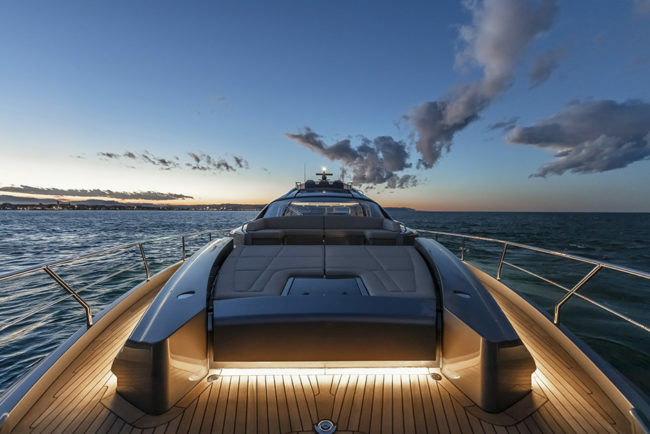 The dashboard is another example of the Pershing core points: technology, design and innovation. 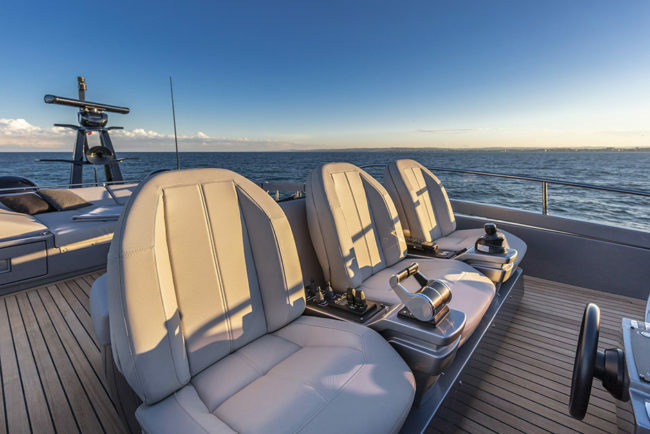 Made together with Poltrona Frau and covered in leather called “Interior in Motion”, it sports three independent seats behind a windshield with no pillars, built using a new glass tempering technology that completely unencumbers the view. Above the helm station there’s also a dark-glass sliding roof. On the port side of the deck a companionway leads to the lower deck with four cabins: the full-beam master suite in the middle, the VIP to bow and the two guests rooms along the corridor. The latter share the third bathroom, and both feature two beds plus the possibility of adding a third bunk. 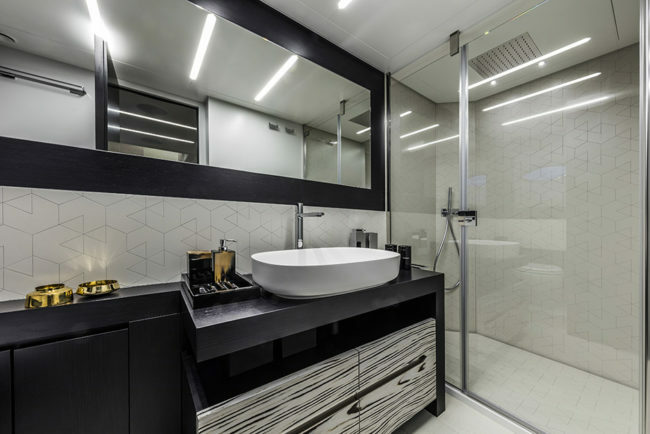 The master cabin reaches 20 sqm, with the walk-in closet and the bathroom creating a five-meter gap from the the engine room to improve quietness. A chaise longue and a vanity corner complete the features. 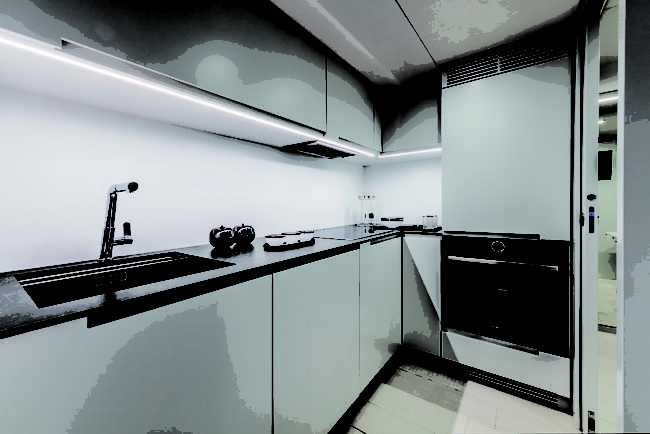 Also on the lower deck is the galley, with double access: from a staircase to the left of the main deck or from the crew quarters, with two doors that can separate it from one or the other areas, depending on…who is going to cook. 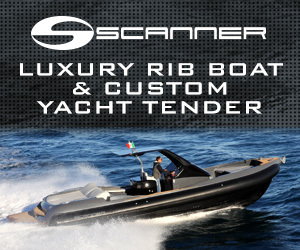 The headroom of all areas, on deck and below deck, exceed two meters. 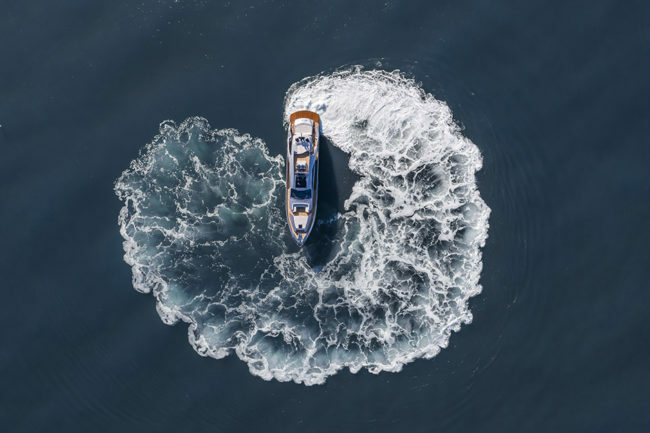 Another innovation, debuting on Pershing 8X, is a system called Music ∙ Hull: the wordplay with music hall makes it clear that it is an audio system integrated into the hull. 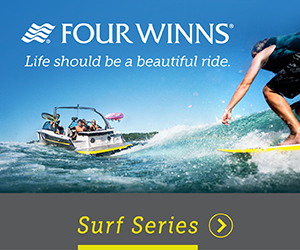 In fact, this technology allows you to listen to music when underwater, during scuba diving or – preferably – while taking a swim. 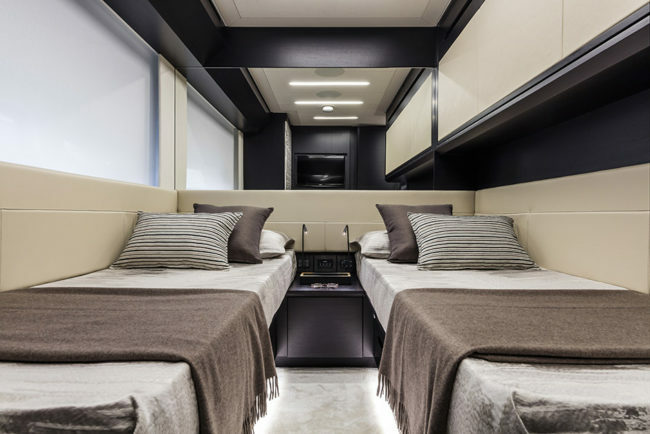 Developed by the Engineering department of Ferretti Group in collaboration with Videoworks, Music ∙ Hull transforms the hull itself into a speaker for high-definition sound diffusion, and is managed by the VOTIS infotainment system, which combines the remote controls of the devices and is expandable to the domotics automation system in all areas, as well as being manageable by smartphones and tablets, by owner and guests. 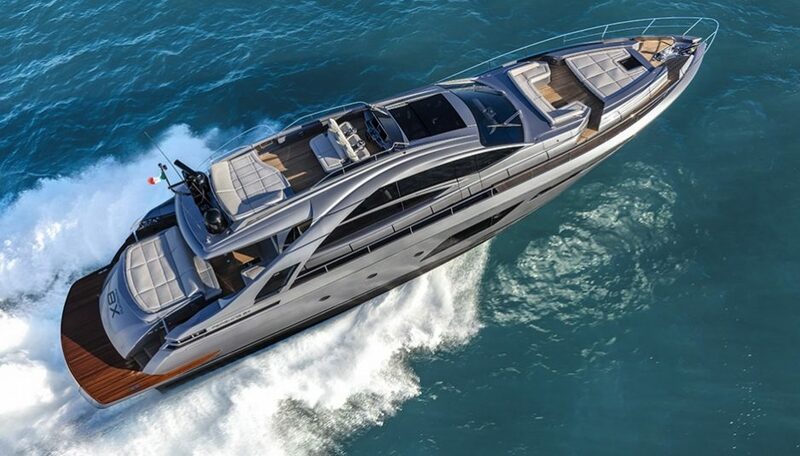 Pershing 8X is powered by two 2435 hp MTUs, combined with TopSystem transmissions with surface propellers. 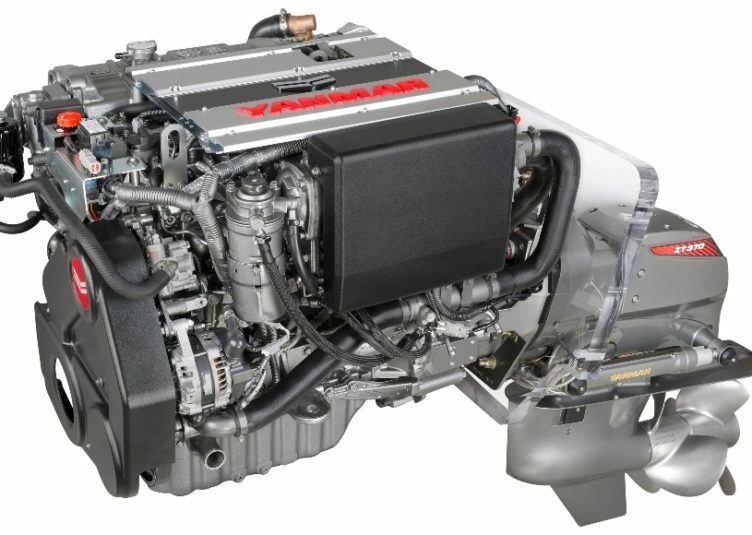 With this standard engines the yacht reaches 45 knots for a cruise of 38, and has a maximum cruising range of 320 nautical miles. 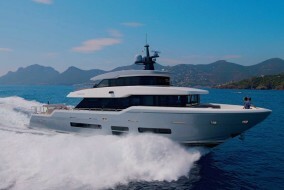 However two more powerful MTUs are available: 2638 horsepower each take Pershing 8X over 48 knots and to a cruise of 41. 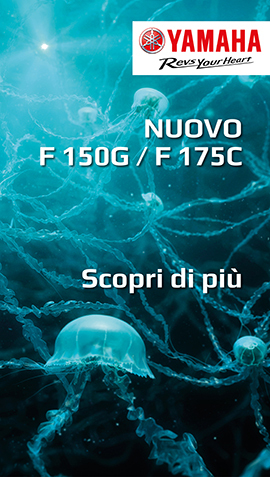 Of course, this is the figures we have from the Shipyard, but we promise that as soon as we have the chance we’ll go and test the 8X to tell you everything. 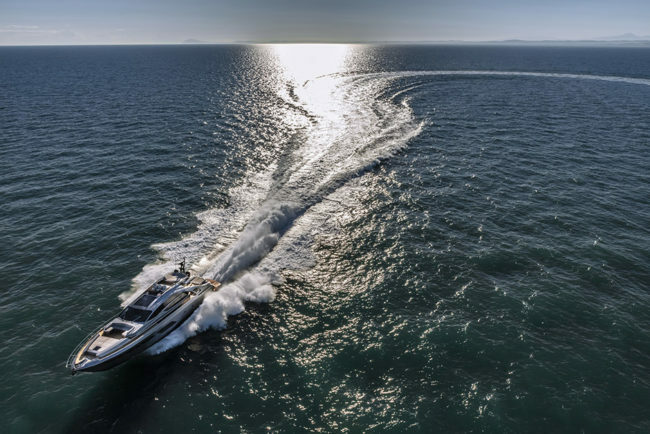 As seen on the larger 9X, Pershing 8X also boasts the advanced system combining propulsion control to maneuvering, navigation and monitoring systems. 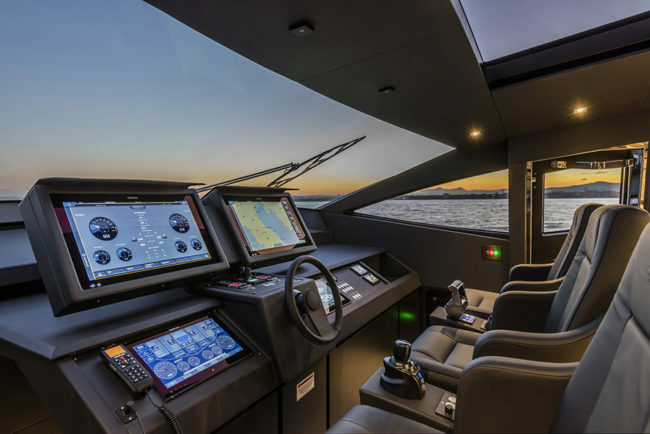 The Engineering department, together with some of the Group’s partners, has implemented some solutions that offer the captain an intuitive tool whose interaction between engines, on-board instrumentation and home automation is true and effective. 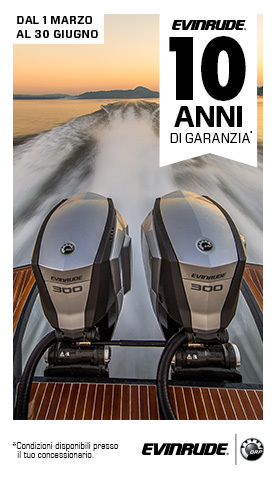 The interface between engines and transmissions was created by Top System with Onyx, for the EasySet system, and with Xenta Systems for steer-by-wire electro-hydraulic steering, supported by Naviop-Simrad LOOP for navigation and monitoring systems. Everything is integrated and available to the pilot through carbon panels and touch screens up to 24” framed by Poltrona Frau leather. 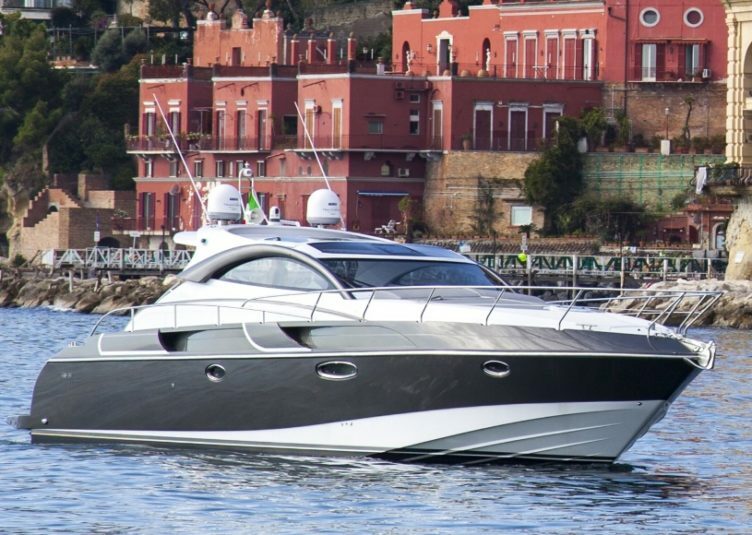 Upon request the owner can install the propulsion package developed by the partnership between Pershing and Top System, which offers a new version of the EasySet system: it can optimize the set-up and performance in navigation, but is possible to bypass it any time by manual control. 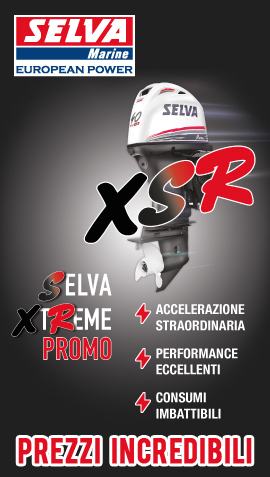 Last but not least, within the same package a joystick coupled to the surface drive has been released, in order to allow excellent maneuverability in port and in restricted waters despite the surface propellers. 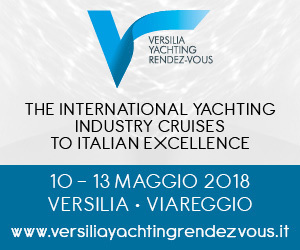 Add to this the new DPS (Dynamic Positioning System) that maintains the position of the boat even in strong wind or tide: a useful solution when preparing for mooring, or waiting to refuel or to pass an opening bridge.